Technology has come at the forefront to connect lenders and borrowers almost instantly and in a seamless way. Fintech players have come up with innovative solutions to reach borrowers and offer credit in more convenient ways. Borrowers are spoilt for choice, be it home loan, auto loan, personal loan or loans for consumer products. Lenders are looking for new ways to offer better value to customers. 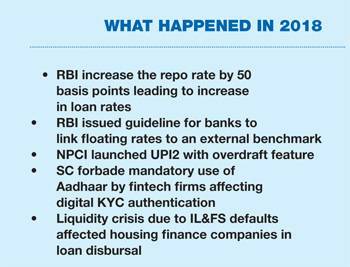 So, here is what you can expect things in the year 2019 as a borrower. RBI has been trying to make the interest rate more transparent for borrowers. 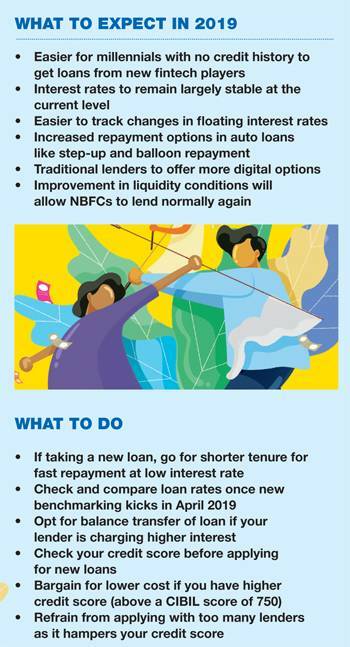 During the last decade, the central bank introduced two changes - base rate and Marginal Cost of Funds based Lending Rate (MCLR) - to make it easier for borrowers to understand their interest rate. But the result was not satisfactory. RBI has now come up with a guideline for banks to peg their floating rate loans to an external benchmark. As the new regulation will kick in from April 2019, borrowers who will take floating rate loans, especially home loans, would be able to track any rise or fall in their interest rate more easily. But what will the interest rate levels be? Year 2018 saw interest rates turn around as RBI increased the repo rate twice since June, and each time by 25 basis points. The recent rise in interest rate was primarily driven by high crude oil prices and rising retail inflation. However, brent crude oil prices have cooled down of late. "With the projected GDP growth at above 7 per cent and estimated inflation rate to be moderate, the immediate outlook for interest rates is stable. India remains a growth focused country, where we need interest rates to remain stable and hence, we see limited upside in the interest rate movement in 2019," says Virendra Sethi, Head of Mortgages and Other Retail Assets, Bank of Baroda. 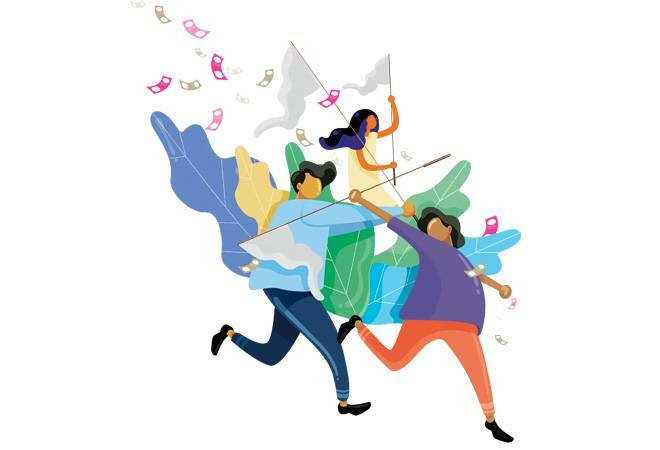 While borrowers may feel relived as they may not have to face higher EMIs, investors who primarily depend upon fixed income investments, like the senior citizens, may have to settle with the current level of interest income in 2019 also. Defaults by IL&FS had put pressure on some non-banking finance companies (NBFCs) in the housing finance sector due to the worsening liquidity scenario. Typically, during tight liquidity situations, lenders go slow in sanctioning and disbursing new loans, which in turn reduces choices for borrowers. However, things have improved. "RBI has relaxed the norms for direct assignment of loans by NBFCs to banks, which will improve the liquidity position of NBFCs from Q4 (January-March 2019) onwards and hence some amount of recovery is expected in the growth rate in Q4," says Sethi of Bank of Baroda. Banks which have larger market share in housing finance are not affected by the crisis and continue to lend. Most of the bigger housing finance companies have also arranged for finances and are ready to lend in 2019. Another change that can be expected next year is an increase in home loan takers in non-metros. Though home loans have been more popular in big cities, of late, people in smaller cities have also been going for home loans to buy or build properties. "Tier II and Tier III cities have definitely seen higher growth over the past few years on the back of rise in affordable housing and Pradhan Mantri Awas Yojana (PMAY) subsidy scheme. We are seeing very good demand for home loans from Tier II and Tier III cities, and we expect this segment to grow more than the overall home loan growth in 2019," says Ashwini Kumar Hooda, Deputy Managing Director, Indiabulls Housing Finance Ltd.
New-age non-bank digital lenders are trying to reach out to new customers. "Apart from the digital experience, fintech players are also able to cater to customer segments that have traditionally not been served. This is also giving an edge to fintech players in a highly competitive market. That being said, the market is currently at a nascent stage and there is room to grow for multiple players," says Gaurav Chopra, CEO and Founder, IndiaLends. The next frontier where most of the innovation is taking place is speed of service delivery. "The speed of transactions has also increased with fintechs. Focusing on technologies such as blockchain in the finance sector will help fintech companies achieve customer satisfaction and loyalty," says Ketan Patel, Chief Executive Officer, CASHe. Digital lending is poised for higher growth with fintechs coming up with innovative products and traditional lenders may also join in. "The emergence of new fintech products in the buy now, pay later realm is poised to take the short-term credit market by storm. Fintech is changing the depth of financial services and incumbents need to seize the opportunity to collaborate with fintech players, to remain relevant in the future," says Bhavin Shah, Partner, Financial Services Tax Leader, PwC India. To face the challenge from fintech players, traditional players like banks and credit card providers are likely to come up with more online and on the spot finance options in 2019. Going through digital aggregators will also help traditional lenders enhance their reach. "Today, BankBazaar (a digital aggregator) services have been accessed by people from more than 1,300 cities across India. We have seen a six-fold increase in traffic coming from Tier II and Tier III cities over the past two years, with the contribution from these markets up to 43 per cent in 2018 from 26 per cent in 2016," says Adhil Shetty, CEO, BankBazaar. Banks are leaving no stone unturned to come up with their own response to fintech firms. "While they (fintechs) are nimble footed, banks have the strength of scale and experience with operating around existing regulatory frameworks. I believe that the synergy between these two market forces will go a long way in co-creation of not only innovation ecosystems but also solutions of scale to bring enhanced experience and cost efficiency for the entire BFSI industry," says Ritesh Pai, Chief Digital Officer, Yes Bank. Credit cards, too, will become more digital friendly. IndusInd Bank, for example, has come up with an interactive credit card in which the plastic card has inbuilt digital features that enable customised transactions right at the Point of Sale terminal. Credit card providers are collaborating more with online merchants. "E-commerce will continue to play a significant role in driving credit card spends. Also, the millennial consumer segment will be the driver of growth. By 2021, a third of India's population will be millennials. We will see the card industry continuously evolve to develop products and services catering to the lifestyles and aspirations of this consumer segment," says Hardayal Prasad, MD & CEO, SBI Card. UPI has seen an unprecedented rise in digital transactions and is likely to remain a popular platform for lending as well. "We are in a testing phase of UPI 2.0 features, which include offering overdraft," says Rajiv Anand, Executive Director (Retail Banking), Axis Bank. To meet rising customer expectations, lenders will keep on improving their lending processes and services. "We expect higher real-time decision-making process, and straight-through processing in areas like loan processing. Mobile devices and wearables may find deeper integration with banking and payment services," says Ramaswamy Venkatachalam, Managing Director - India and South Asia, FIS. Bank of Baroda was among the first to introduce a home loan product that offered lowered interest rates to people with higher credit scores. "Since the time we implemented risk-based pricing, we have seen good growth in the home loans business and we have clocked 40 per cent growth in Q2 (July-September 2018). We hope to continue at a similar growth rate going forward. We have started working on improving customer experience, and we are building various analytical models that will help us offer retail loans at greater speed and with minimum documentation," says Sethi of Bank of Baroda. In the wake of the issue of growing non-performing assets (NPAs), more lenders are likely to venture in this direction. Aadhaar-based authentication helped fintech players grow rapidly as it was cost effective and time saving. But the Supreme Court's verdict on Aadhaar has changed that. "As Aadhaar-based eKYC has been discontinued, fintechs will come up with innovative ways to do eKYC digitally and have innovative products to acquire customers," says Chopra of IndiaLends. Explaining how the future KYC may work, BankBazaar's Shetty says, "The penny drop feature clubbed with Aadhaar (i.e., optional at the discretion of the customer) can together suffice for the KYC requirements. The above two factor (OTP-based e-KYC and Penny Drop) authentications can make the verification processes less expensive for the financial institution, and less complicated for the potential customer. This solution, to a large extent, also plugs identity theft that can be affected by stealing another person's cell phone or SIM card while conducting the e-KYC via OTP authentication."